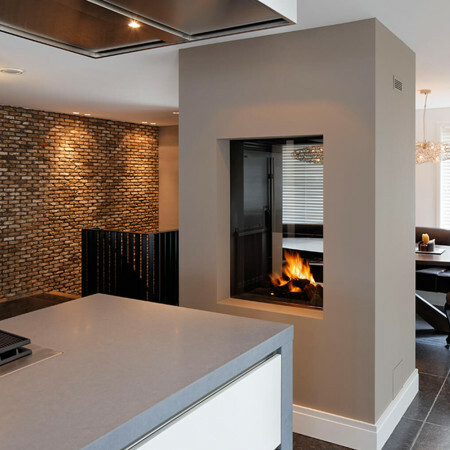 This high efficiency gas fire (closed double sided fireplace) can be easily installed between two rooms to create a wonderful visual connection and a stunning focal feature for both spaces. Combining heat efficiency with beautiful, functional design, the Sky T provides maximum visual transparency with a glazed area up to eye height. It could equally be installed in the middle of a room to create a subtle divide and with a heat efficiency of up to 80% and a heat output of 9.8kW, this high efficiency gas fire can heat up a large area. For technical information on how a high efficiency gas fire can be incorporated into your scheme, get in touch.